I don’t know how much you know about Detroit, online but pretty much every diner in the Detroit Metro area serves Greek food, which means you can get Greek Salad, Gyros, Tzatziki, Lemon Rice Soup, Saganaki (Greek fried cheese) and Spanokopita anytime, anywhere. It’s amazing. We always hit up Leo’s Coney Island when we’re in town and I can’t wait to get my fix when we’re there for Christmas. So, it turns out, Tom loves Spanokopita. This was news to me since he almost always gets the Gyro or the Greek salad or the Lemon Rice Soup. Never the spinach pie. Nonetheless, I was craving a good Spinach pie with a flaky filo crust, so I got to work. I made a simple stuffing with sauteed onions, garlic, spinach, lemon and good feta cheese. I also didn’t add filo to the bottom of the baking dish because it always gets soggy. Tell me, what is the point of filo dough if it isn’t crisp and flaky? But don’t worry, I added a few extra sheets to the top to made up for it. It was everything I could ever ask for in a light lunch or snack – flaky, flavorful, full of good stuff and delicious. Before you start, make sure your filo is thawed according to package instructions and don’t open the package until you’re ready to use the filo or it will dry out. Store any extra dough according to package instructions. Preheat the oven to 375° and set a large pot over medium heat. Once it’s hot, heat the oil then saute the onions for about 6 minutes, or until they’re soft and just starting to brown. Add the garlic and saute for another minute. Add the spinach leaves, lemon zest and juice and oregano. Cook until the spinach is completely thawed. Add the feta and stir until evenly combined. Transfer everything into a fine mesh sieve and drain of excess liquid by gently pressing down on the mixture. Transfer the spinach mixture to a small, greased baking dish (I think mine was 8×8). Open your filo dough and begin layering sheets over the spinach, brushing each layer with some olive oil before adding another layer. The olive oil helps make your filo crisp and flaky instead of dull and doughy. Continue until you use up the 10 sheets of filo. Bake for 30 minutes, or until golden brown. Let cool for 10 minutes before cutting into squares to serve. Makes 4 entree-sized portions or 8 – 10 snack-sized portions. This was already one of my favorite things to eat. Now it’s one of my favorite things to look at. Photo set is gorgeous! 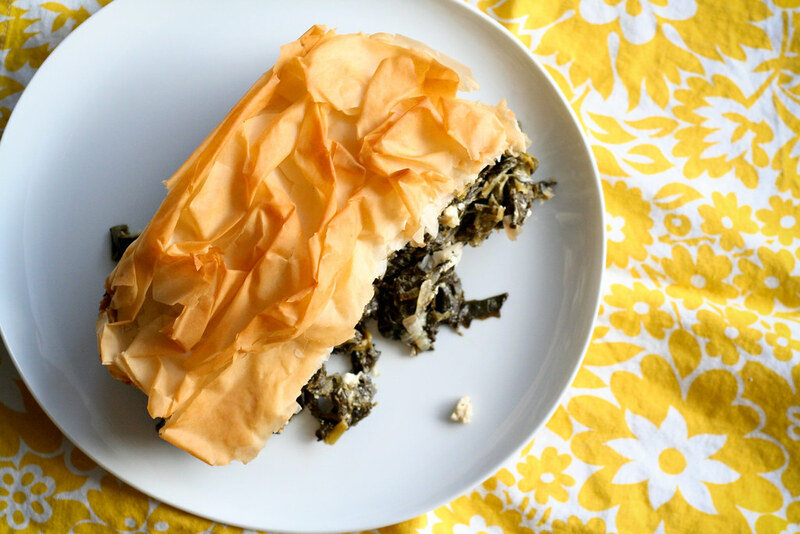 I love spanakopita! I will have to try your version; brushing the filo with olive oil. My recipe calls for loads of butter, while delicious, I feel guilty eating it! Thank you! this was AMAZING, thank you so much for posting this, i just made it! 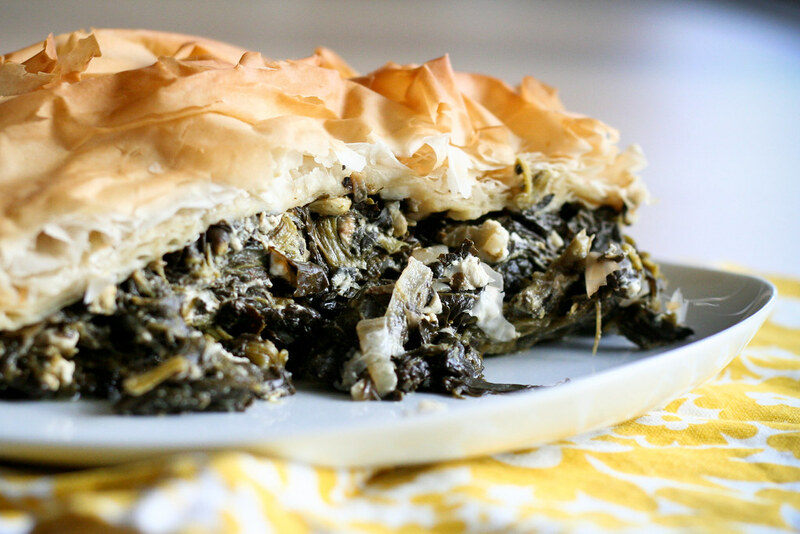 WOW, so flavorful and perfect, tastes like homemade spinach pie from a local restaurant! my family could not stop eating it! Copyright © 2019 Bitchin Camero. All Rights Reserved.